The Windows operating system does not support different sensitivities for input devices. Users who work with touchpads and mice on the computer may experience issues because of this. Some users may for instance feel that the mouse cursor is moving to fast when they connect a mouse to the system or that the touchpad speed is too slow to their liking. The reason is simple: Manufacturers set the input sensitivity for touchpad devices to a high level to improve the touchpad's responsiveness. These values are often however too sensitive for mice. If you connect a mouse to a laptop with touchpad you may experience that the mouse cursor moves to fast on the system. While it is possible to change the sensitivity whenever you connect a mouse - and back when you disconnect it - you may prefer an automated solution that changes the sensitivity automatically whenever the input device is switched. Automatic Mouse Switcher -- A free open source program that supports mice and touchpads. Mouse Speed Switcher -- compatible with all versions of Windows. The program is not free unfortunately. Auto Sensitivity -- the program is no longer in active development, it may not work anymore. 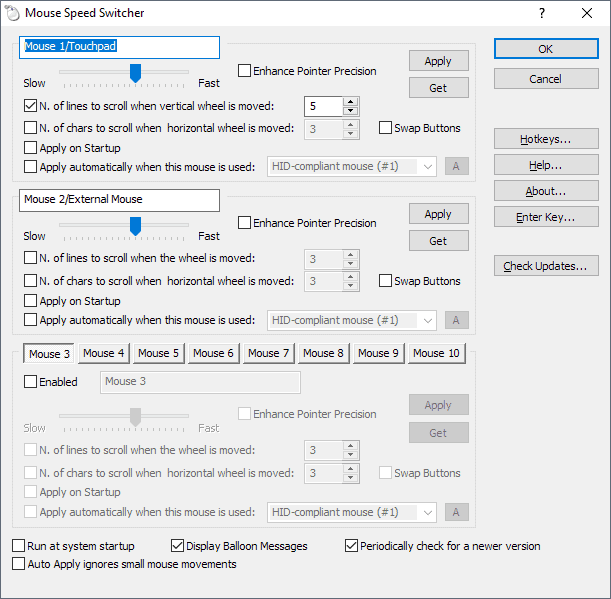 Automatic Mouse Switcher is an open source Windows program that supports different mouse speed settings for touchpad and any mouse you connect to the device it runs on. The application requires that you install a couple of libraries but those are included in the program package so that you don't need to go hunting for those. It detects a connected mouse and touchpad devices automatically when you run it; use the refresh button to scan the system for new devices if you need to. You can open the mouse configuration to modify the speed of the device individually. The program applies the correct setting then automatically whenever it recognizes the mouse or touchpad. Make sure you select "use current config" to apply the changes. Mouse Speed Switcher supports up to ten different mouse and touchpad settings that you can switch between manually or automatically. You can assign settings to a specific mouse or touchpad, and enable each manually using hotkeys or the system tray icon. 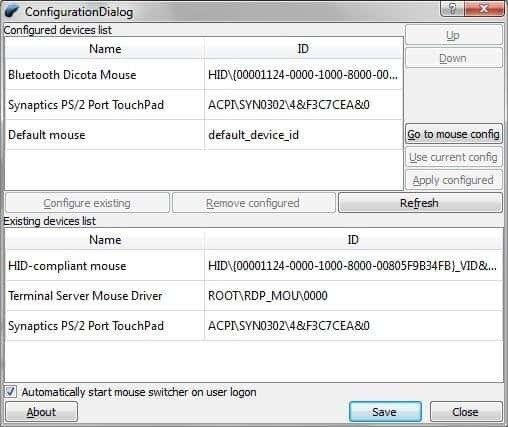 The commercial version of the program detects all connected and configured mice and touchpads to change the speed of the devices automatically. You can customize a lot of settings during setup including the speed of the mouse and pointer precision, but also whether you want the settings to be applied automatically when the mouse is connected or buttons swapped. Mouse Speed Switcher is a commercial program for Windows. You can use an unlimited version for 15 days and if you don't purchase a license afterward, automatic switching is disabled. Auto Sensitivity is a free program for the Microsoft Windows operating system that automates that process. It allows you to define different sensitivities for the computer's touchpad and connected mice. In other words: it ensures that different speeds are used for the mouse and touchpad without you having to change settings manually each time you switch input devices. Just run the program on your computer and use the sliders to set the different sensitivity levels. A click on get current moves the slider to the current system sensitivity setting. It is usually necessary to test different sensitivity levels during configuration which may require you to connect and disconnect the mouse several times during the process. How does the program work? The program sets the sensitivity to the selected touchpad value unless a mouse is connected to the computer. If you connect a mouse it will automatically switch to the selected mouse sensitivity, and when the mouse gets disconnected it will switch back to the touchpad sensitivity. Please note that the touchpad will use the mouse sensitivity whenever a mouse is connected to the PC. If you use mouse and touchpad at the same time, you may run into issues because of it. You can configure the program to start minimized and at system startup. Auto Sensitivity is a specialized tool that is useful for laptop users who experience speed issues when they connect a mouse to their laptop. The Open Source program requires the Microsoft .Net Framework 3.5, it can be downloaded from the project's Codeplex website. Find out how to setup your Windows desktop PC or laptop so that different speeds (sensitivities) are used depending on mouse or touchpad. This would be a joy for my work laptop; however they don’t allow us to connect so much as a USB key, never mind load software onto them!